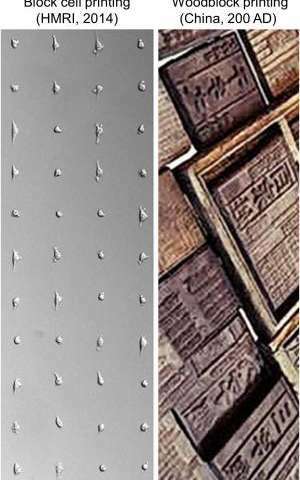 With a nod to 3rd century Chinese woodblock printing and children's rubber stamp toys, researchers in Houston have developed a way to print living cells onto any surface, in virtually any shape. Unlike recent, similar work using inkjet printing approaches, almost all cells survive the process, scientists report in this week's Proceedings of the National Academy of Sciences. The researchers, led by Houston Methodist Research Institute nanomedicine faculty member Lidong Qin, Ph.D., say their approach produces 2-D cell arrays in as little as half an hour, prints the cells as close together as 5 micrometers (most animal cells are 10 to 30 micrometers wide), and allows the use of many different cell types. They've named the technology Block-Cell-Printing, or BloC-Printing. "We feel the current technologies are inadequate," Qin said. "Inkjet-based cell printing leaves many of the cells damaged or dead. We wanted to see if we could invent a tool that helps researchers obtain arrays of cells that are alive and still have full activity." Recent work to print cells in two and three dimensions using electricity-gated inkjet technology have been largely successful, but sometimes only half of the printed cells survive the printing process—a source of frustration for many laboratory scientists. "Cell printing is used in so many different ways now—for drug development and in studies of tissue regeneration, cell function, and cell-cell communication," Qin said. "Such things can only be done when cells are alive and active. A survival rate of 50 to 80 percent is typical as cells exit the inkjet nozzles. By comparison, we are seeing close to 100 percent of cells in BloC-Printing survive the printing process." BloC-Printing manipulates microfluidic physics to guide living cells into hook-like traps in the silicone mold. Cells flow down a column in the mold, past trapped cells to the next available slot, eventually creating a line of cells (in a grid of such lines). The position and spacing of the traps and the shape of the channel navigated by the cells is fully configurable during the mold's creation. When the mold is lifted away, the living cells remain behind, adhering to the growth medium or other substrate, in prescribed formation. Qin's group tested BloC-Printing for its utility in studying cancerous cells and primary neurons. By arranging metastatic cancer cells in a grid and examining their growth in comparison with a non-metastatic control, the researchers found they could easily characterize the metastatic potential of cancer cells. "We looked at cancer cells for their protrusion generation capability, which correlates to their malignancy level," Qin said. "Longer protrusion means more aggressive cancer cells. The measurement may help to diagnose a cancer's stage." The researchers also printed a grid of brain cells and gave the cells time to form synaptic and autaptic junctions. "The cell junctions we created may be useful for future neuron signal transduction and axon regeneration studies," Qin said. "Such work could be helpful in understanding Alzheimer's disease and other neurodegenerative diseases." While it is too early to predict the market cost of BloC-Printing, Qin said the materials of a single BloC mold cost about $1 (US). After the mold has been fabricated and delivered, a researcher only needs a syringe, a carefully prepared suspension of living cells, a Petri dish, and a steady hand, Qin said. Inkjet cell printers can cost between $10,000 and $200,000. "BloC-Printing can be combined with molecular printing for many types of drug screening, RNA interference, and molecule-cell interaction studies," he said. "We believe the technology has big potential." While the fidelity of BloC-Printing is high, Qin said inkjet printing remains faster, and BloC-Printing cannot yet print multi-layer structures as inkjetting can.